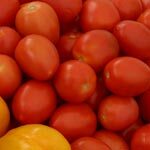 Tomatoes are a warm season crop and grow best on well-drained soils that are high in organic matter. For earliest production a light soil is preferred on a gently sloping (2% or less) site with a southern or eastern exposure. 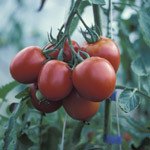 Although it may be possible to grow tomatoes in southern New England from direct field seeding, production from transplants is the standard practice. The key to early fruit production is growing good transplants with plenty of space during the transplant growing stage. Adequate spacing produces a short, stocky plant about as wide as it is tall with a good root system. Ideally the plants should be spaced on the greenhouse bench so leaves do not touch or overlap during the transplant growing period. One oz of tomato seed will produce about 7,400 plants. Sow tomato seed in artificial mix (vermiculite-peat base works well) and maintain uniform moisture and bottom heat at 75°F until emergence. Some growers are using compost-based mixes. This is especially important for producing organically certified plants. Be sure the compost-based mixture is acceptable to the certifier. Transplant young seedlings into 2” to 3” plant growing containers when they have two true leaves. Alternatively, if there are facilities for producing plug transplants, you may want to experiment with this method for tomatoes. For earliest production, some growers finish their transplants in 6” (or even larger) pots. For the later, main season crop, the smaller 2” to 3” containers are acceptable. Plants for a September-October crop can be started in 1” cells, but these containers are too small for earlier production. Do not attempt to hold plants in small cells. Plants will become leggy and production can be delayed two to three weeks. Grow the transplants at 70°F to 75°F day and 60°F to 65°F night temperature. Night temperatures in the greenhouse below 60°F will likely result in rough fruit (catfacing) on the first few clusters. Five to eight weeks from seed are required to produce field-ready transplants, depending on the temperature at which the plants are grown and the size desired. Do not start the plants too early; otherwise they have to be overhardened or held too long before planting. Harden only slightly, by reducing water and nutrients, and/or by transferring to a cold frame. Do not reduce temperature below 60°F. Small plants that have been slightly hardened, or not hardened at all, will out perform larger, over hardened plants. Transplants should be given a complete nutrient solution supplemented with trace elements (the latter especially if artificial mixes are used) at weekly intervals. Alternatively, they can be fed whenever they are watered with a dilute nutrient solution. The advantage to the latter system is that the fertilizer is supplied more in relation to the plant’s needs: more on bright, warm days; less on cool, cloudy days. In either case, follow directions on the fertilizer label for amounts to feed. Use a soluble fertilizer and be careful of salt buildup. It is advisable to use a fertilizer in which most of the nitrogen is in the nitrate form rather than ammonium or urea.